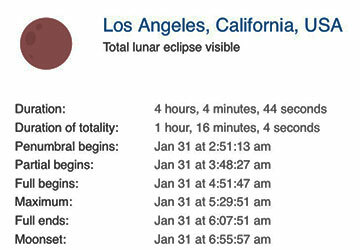 But first, the screenshot below, courtesy of timeanddate.com, shows the local times for the beginning and end of the lunar eclipse of January 31, 2018. Check it out and choose when you will get up to take a look or a photo or if you will just sleep in and watch it on TV the next day! During totality, some estimators put the visible magnitude at about 1.0, much dimmer than the normal full moon magnitude of about -12.7. So, I am tempted to get up early and watch the bright moon change, slowly over a period of about two hours, to a very dim moon. When are you planning to get up? If you plan to get up early enough to see the whole thing, be sure to let me know way in advance so that I can decide to maybe just sleep in! As a member of AAVSO, I get email alerts whenever a member discovers some interesting astronomical observation. So if you have not ever seen an alert before, let's check one out. The alert below announces a discovering of a nova on January 15 by an observer in Australia. The discovery magnitude was 7.0 so we should be able to image that in our telescopes, even in city lights, but, the location of the observer in Australia should tip us off that it might not be visible in the northern hemisphere. Let's check it out! Ok, the reported declination was -65 degrees. Oh, oh, that is not going to be visible here in California. At our 33 degree latitude location here, an object with declination of just -57 degrees will be right on our horizon, so we don't have a chance of making any follow up observations. It is also interesting to find in the alert that the discoverer, Rob Kaufman, used a Canon DSLR with 55mm lens. Wow, that is a wide field of view lens, so he must have been taking various sky location pictures and then comparing them between previous images to see if any new pattern emerges. So, we see that it is possible for someone with just a DSLR camera and some blinking software to find and identify a supernova and that is pretty neat! Being an AAVSO member brings you a lot of other benefits, which you can check out at: www.aavso.org, but in the meantime, let's look at this Alert Notice 609. Further sections of the alert show an example of the light curve associated with this event. 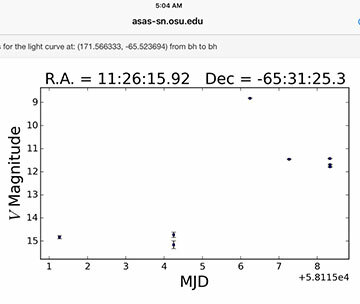 If you look at the light curve below, which only 7 or 8 points, the quiet magnitude of the star was about 15, on MJD day 1, and then when the nova was observed on MJD day 6, the magnitude was much brighter at about 8.7 and then fell on the succeeding observation days. We also get a hint that no observations were done on days 2 and 3 or 5. Hmm, maybe the observer was busy with other things or too much partying? Now if you want to see an image of the nova, then check out the following link. The .gif file blinks the image between the quiescent star and the star during the nova event. 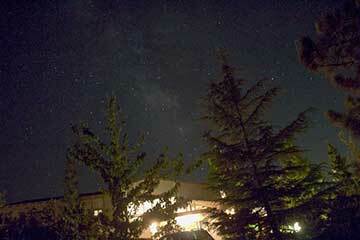 When the image blinks between these two views, it is obvious which star we are interested in. This is really neat so you don't want to miss this and it shows the power of using this blink software technique to overlay two images and look for the differences. 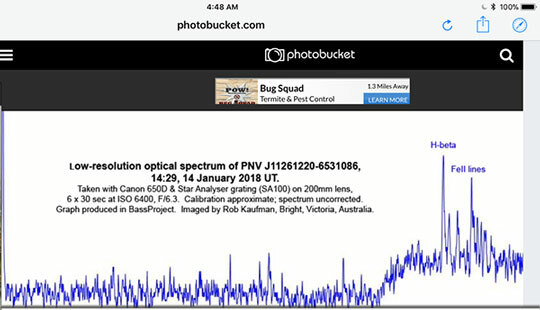 Other AAVSO members also sprung into action when they received the alert and Rob continued his observations and made spectroscopic measurements. The AAVSO alert pointed us to this spectrum taken. This spectrum example is also quite interesting because it was made with just a Star Analyzer (SA200) grating, which just screws onto the DSLR lens. In this case the observer used a 200mm lens. It is also kind of interesting to compare the time at which this spectrum was taken, which is listed as 14:29, January 14 UT, and the nova discovery, slightly different time notation, was only made at January 14.4861 UT. Ok, we can see that 0.4861 of an hour is 29 minutes, but I don't remember exactly but don't believe that that is what the convention is. It seems in that format the 0.4861 means that portion of a full day, which is 0.4861 * 24 = 11:40 UT. I don't know about you but I keep forgetting what the AAVSO convention is and will have to recheck this later. 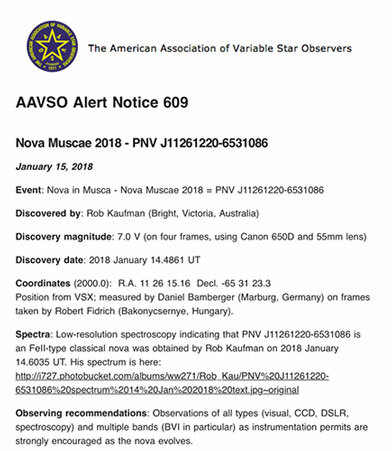 Another section of the alert contains several other observers and the times and locations around the world and of their follow up observation of the nova. Finally, we should pose one more quiz question and that is what was the local time of the discovery in Victoria, Australia? Well, Victoria local time is 10 hours ahead of UT and daylight savings time is still in effect at this time, so we have to add one hour, so my guess is that it is 11:40 + 10 + 1 = 10:40 at night. Is that what you get too? Ok, and now for the bonus question, what time was it in Los Angeles when the nova was discovered? Well, LA is 8 hours behind UT and we are not on daylight savings time now, so, that should make it 11:40 - 8 = 3:40 AM here on January 14. Is that what you get too? We didn't cross some date line in this calculation did we?